The Society is delighted to have Handelsbanken and Handelsbanken Wealth Management as our lead sponsors for the 2017- 18 season. Like most other arts and music societies we are anxious to obtain financial assistance and sponsorship from commercial organisations or private individuals. The task of covering our costs in producing choral concerts is practically impossible, with the production costs being so high. Even if we were to sell every seat in the concert hall, our chances of recovering our costs are slim, placing the burden upon the members to finance the activities. Any opportunity to interest an outside source is taken. In the past, we have obtained financial help from Mazda Cars, Lloyds TSB and English Courtyard, specialists in retirement housing. More recently we have had assistance from St James Wealth Management, Hotel du Vin, Fenwick Elliott, and John Lewis at Home whose logos appeared on publicity material and in some cases were given a page of coverage of their company in our programme and a promotional stand in the foyer of the Assembly Hall at the concerts they sponsored. We publicise our concerts widely both locally and further afield and on our website. We are anxious to hear from anyone interested in sponsoring one or more of the three or four concerts which we give each season. If you, or anyone you know is interested, please get in touch with Ailsa McMahon, ailsamcmahon@hotmail. 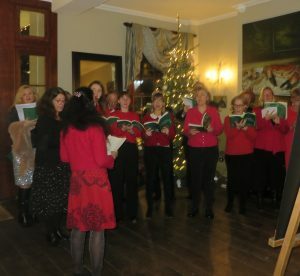 Hotel du Vin are proud to continue to support RTWCS who will be performing in the hotel on Christmas Eve. Do come along.